Theodore Bigby collected his Professional Diploma in Direct and Digital Marketing yesterday from an impressive graduation ceremony held at London’s Royal Geographical Society. The qualification, administered by the Institute of Direct and Digital Marketing (IDM), is a strong indication of a marketer’s commitment to their career. To attain an IDM qualification is “an achievement that can never be overstated and one of which [graduates] should be justifiably proud” states the IDM website. Marketing practitioners who attain the Professional Diploma in Direct and Digital Marketing qualification have gained recognition for their ability to execute, control and measure campaigns. Keynote speakers were Nick Hutton, marketing consultant and chair of the IDM examination board and James Elder, who founded Student Beans aged 22 with his brother. 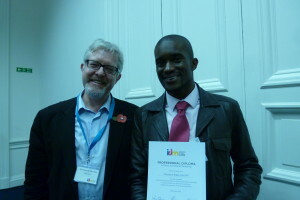 After ten successful years, James is now a frequent international speaker at conferences, schools and universities. Following the awards presentation, the IDM student response was provided by Tony Regan, PG Dip DigM, a strategic planning consultant. 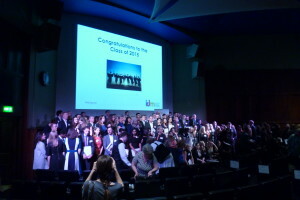 Amid generous applause, graduates collected their certificates on stage from Nick Hutton where they could pose for a picture which was available at the end of the ceremony. It was a wonderful occasion in which marketing practitioners were awarded not only professional diplomas, but also IDM awards, professional certificates, and postgraduate diplomas. All walked proudly upon stage before their peers to celebrate their achievement. The main event was followed by an opportunity to network with other graduates which proved to be very popular. Marketers from the UK and beyond shared experiences and made contacts for the future. For Theodore, the graduation ceremony brings to a close a year of hard work and dedication which has expanded his marketing knowledge immensely. Although most marketing practitioners are sent to the IDM by their employers who will allow them to gain the qualification as part of their employment, Theodore was one of the exceptions who gained the qualification in his own time and funded the course himself. Recognising there were areas he could improve, Theodore decided that the IDM’s Professional Diploma would be the best way to move his career forward. “Like most other people who take this qualification will tell you, I learned a lot during my studies that I was able to apply to my job” said Theodore. The course teaches both skills and a marketing mindset. “[The course] really changed the way think…I can now provide even better analysis of marketing strategies and am able to weigh up the benefits and drawbacks in relation to the desired outcomes more concisely than before” he added. Armed with proven knowledge of how to run campaigns from the beginning, setting targets and evaluating their progress, Theodore will continue learning marketing techniques and working towards an IDM Continuing Development award. He will also look to help individuals and organisations plan and implement successful marketing campaigns.